It's fall ya'll! Rich Fall colors, a bold check plaid and a natural feel make, Autumn Plaid ribbon a perfect choice for your harvest time decorating. Create wonderfully designed wreaths, corn stalks, thanksgiving tables, floral centerpieces and more! 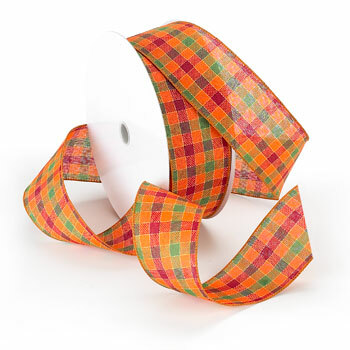 So versatile and the economical price and put-up make this the perfect ribbon for large projects and events. 100% Polyester with wire. Two widths.